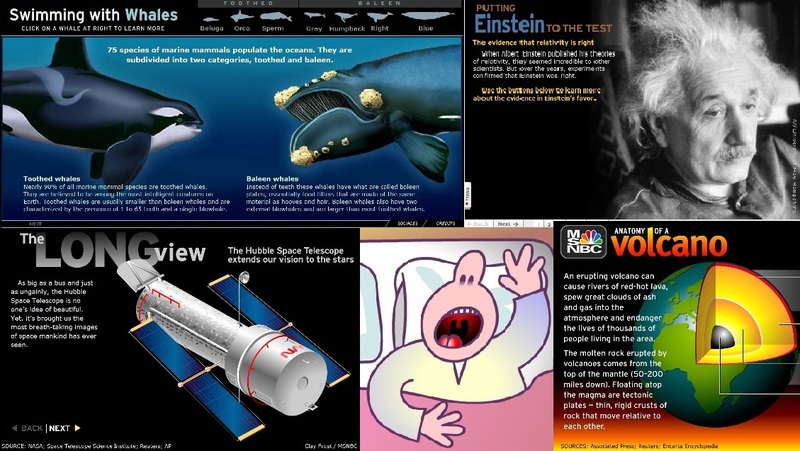 Interactives explain topics ranging from whales to relativity, from volcanoes to Hubble … and why we snore. Scores of interactives on science and health topics were created for MSNBC.com between 1996 and 2012. Some of them have fallen out of date, but many more are just as useful and entertaining today as they were years ago. Click on these links to give the interactives a spin, bearing in mind that your computer has to be capable of running Flash. You will have to give permission for your browser to run the Flash file. Also, some of these interactives are shown in their raw form, without the design formatting that they had when they were first published online. Christmas – What was the star of Bethlehem? Dinosaurs – Are dinosaurs alive? Earthquakes – The next Big One: When? How much damage? Earthquakes – What causes earthquakes? Eclipses (lunar) – Inconstant moon: What causes a lunar eclipse? Eclipses (solar) – Moonshadow: What causes a solar eclipse? Electromagnetic spectrum – Why is the sky blue? Physics – Why are things weightless in orbit? Links may become obsolete due to changes on external websites. Please email alan@cosmiclog.com about non-working links.